bbi-biotech supplies automatic sampling systems for all applications within biotechnology, pharmaceutical, food, cosmetics and chemical industry. Sampling systems by bbi-biotech connect all offline-analytical instruments to every bioreactor type. Bioreactor vessels from stainless steel, glass or disposable materials like bags can be equipped directly or in a bypass. Automated and continuous Sampling – bioPROBE delivers sterile samples at the push of a button or fully automated. 24 hours a day. Every Day. bioPROBE gives you the unique possibility to draw sterile samples anytime you want – without any further preparation; simply by pushing a button or clicking a mouse. Even when bioPROBE is processing a pre-configured sampling plan, you always have the opportunity to take an additional, unscheduled sample. 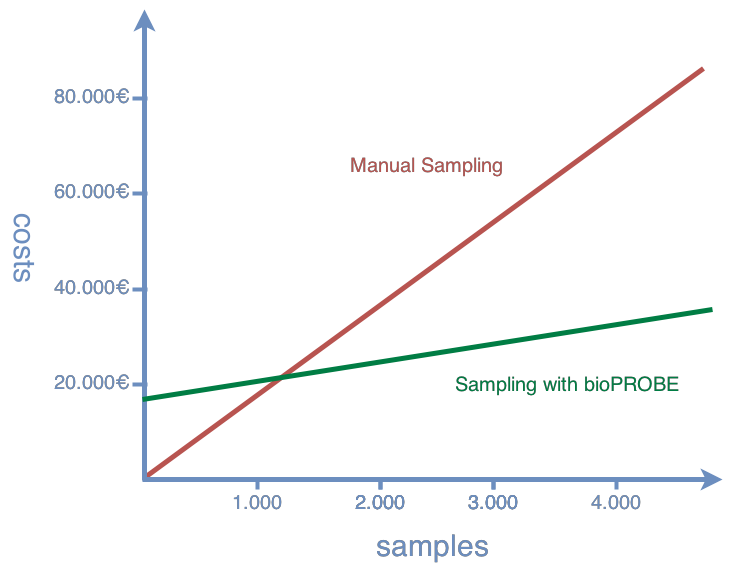 The real strength of bioPROBE is the processing of pre-scheduled sampling plans. 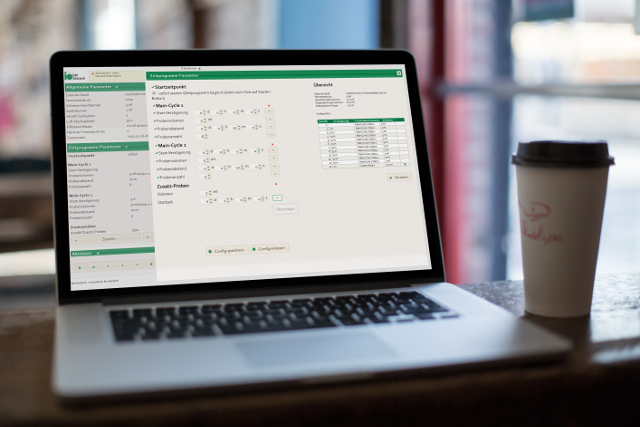 The web interface of bioPROBE, that is specifically tailored to fit the requirements of biotechnological processes, helps to easily create sampling plans by defining equidistant and custom sample steps. Once configured the execution of the sampling plan will be completely automatic. 24 hours a day. Every day. Sterility by Design – bioPROBE operates due to the unique and patented sampling technology sterile and aseptic by design. No clogging filters! No biofilms! Idle phase: A stainless steel or PEEK seal closes under pressure like a check valve the fermenter. The pressure is constantly monitored and maintained by an elaborate leakage management system. Sampling phase: The seal is opened. Medium, embedded in a sterile gas cushion, is transported in the desired quantity from the bioreactor. Like in a S4 laboratory negative pressure ensures that medium can only flow from the bioreactor to the outside. The path towards the bioreactor remains blocked, the sterility of the culture is guaranteed at all times. 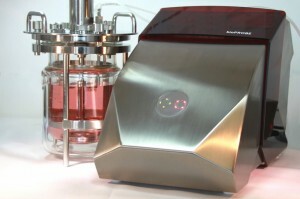 Dead volume free – bioPROBE is suitable for even the smallest culture vessels. Reduce the loss of valuable product due to sampling to an absolute minimum. bioPROBE samples from the bioreactor only the volume that is necessary for the analysis or quality control. bioPROBE allows smallest sample volumes from 0.5 ml, with no volume wasted in tubes or other parts of the sampling system. By transporting the sample in a cushion of sterile gas, the tubing system is cleaned automatically. The entire volume is available for the analysis, nothing is discarded. Labor and time reductions – bioPROBE reduces the time for sampling from bioreactors dramatically. Save time, money and work hours. Until now sterile sampling from a bioreactor was time- and labor-intensive. bioPROBE reduces the costs for trainings and lab staff dramatically. 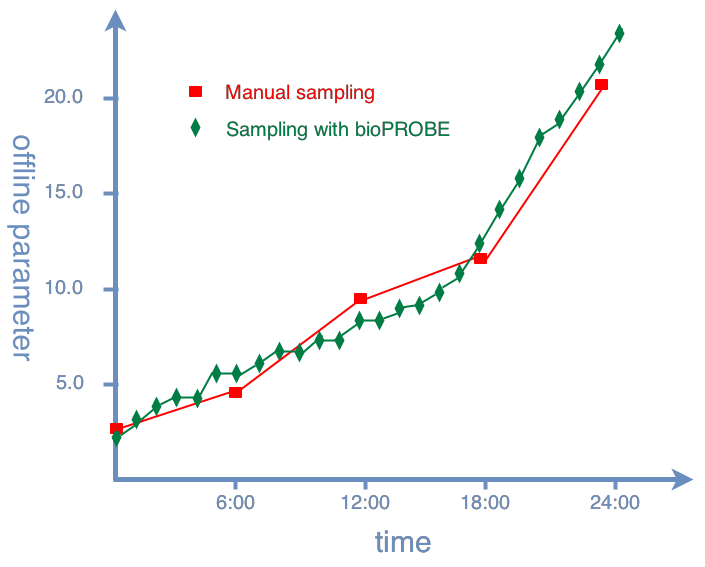 bioPROBE simplifies and accelerates the process of sterile sampling enormously. For this reason bioPROBE pays for itself normally within less than a year. More samples for the same price – Get better results by taking more and more accurate samples without increasing the costs for sampling. One of the key advantages of the automated sampling approach with bioPROBE: Additional samples at virtually no additional marginal costs. Easiest operability – bioPROBE is configurable with every PC or smart phone via a standard browser (e.g. Chrome, IE, Firefox). Its operation can be learned in less than 5 minutes. bioPROBE uses modern web technologies to provide the best user experience possible and utmost convenience. Configure and check on bioPROBE via PC, tablet or a smart phone from your office, your lunch break or even from home. Sterile samples for everybody. – bioPROBE reduces the need for highly qualified lab personnel to draw sterile samples from a bioreactor | fermentor. Operating bioPROBE is easier than making coffee. Gain flexibility – Don’t become a slave of your sampling plan. With bioPROBE you decide when to be in the lab. bioPROBE is available in various versions. bioPROBE single is the entry-level version of automatic and sterile sampling from bioreactors and fermenters. It does not require much space in table-top installation and is easy to integrate into existing laboratory installations. The sophisticated system design completes the Process Analytical Technologies with quality and functionality. 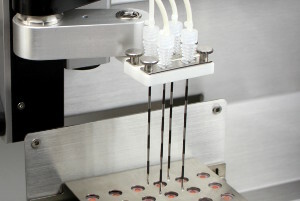 An autoclaved sterile hose set secures the fixed connection of bioPROBE single with any type of bioreactor at any place. It is mobile and can easily be transferred to another bioreactor or fermenter, if required. bioPROBE single can be completed with SAM-Series handling systems to build a closed and fully automatic sampling system. An optional flushing system can be integrated in case of extended sterility requirements. The complete seperation of all fluid paths of bioPROBE quad allows simultaneous automatic sampling from up to four bioreactors in parallel operation – all around the clock. This prevents reliably cross contamination and mistakes that often occur during manual sampless. Systematic or optimization experiments increase data quality, while the staff can concentrate on data analysis and presentation. 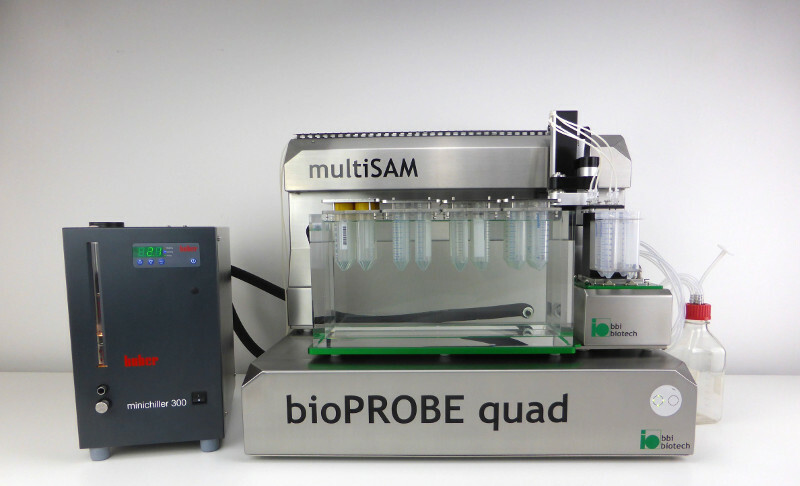 The cases of the bioPROBE quad are designed for optimal positioning below our xCUBIO Bioreactors, but they do not require much space under other controllers as well. You gain space for other tasks and take full advantage of sterile automatic sampling in your new culture system – from laboratory to production scale. Consider this option already in the design of your new culture systems. We customize bioPROBE according to your requirements. Whether single, autoclavable vessel, multi-installations of glass and / or plastic containers, scaled in-situ sterilizable systems – from the basic building blocks bioPROBE single and bioPROBE quad we are able to develop the optimal sampling device according to your requirements. The sterility of all sampled vessels remain unaffected by strict separation of the sample transport routes.